Noongar song, dance, art and culture are centre stage at the 8th biennial Keela Dreaming Festival in Kellerberrin. The Kellerberrin Aboriginal Progress Association (KAPA), supported by CAN WA is pleased to announce a stellar line-up of quality Noongar acts for the upcoming festival. Country rock outfits Bad Influence and the Patch Up band will join Gina Williams, Guy Ghouse and David Hyams, Wadumbah and many more on the main stage at Kellerberrin Greater Sports Ground. This year’s festival will also feature an amazing showcase performance of songs written and performed by local singer-songwriters from CAN WA’s Voices of the Wheatbelt: Healing Songs project. 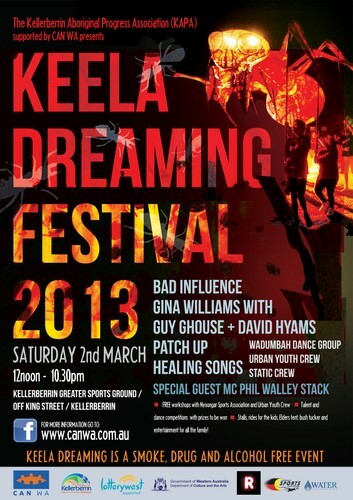 The 2013 Keela Dreaming Festival will offer something for everyone: from bush tucker, community stalls, hip hop dance workshops by Urban Youth Crew and traditional games and football skill sessions by Nyoongar Sports Association. For more information go to: www.canwa.com.au or visit CAN WA on Facebook.